Donald Trump gets a grilling in Gourmet Burger Kitchen's latest ad campaign, which lampoons the US presidential candidate by comparing him to a hamburger. 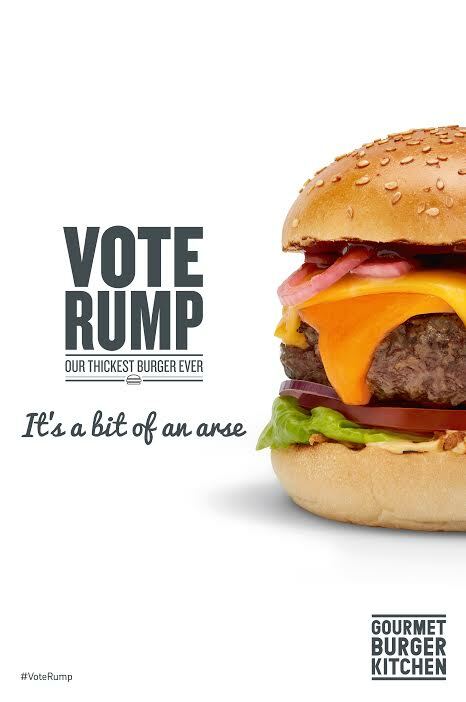 GBK’s "Vote Rump" outdoor campaign uses different taglines with double entendre poking fun at Trump, such as "Vote Rump – it’s a bit of an arse." Other taglines have been created alongside the ad’s visual of a GBK burger, such as "Vote Rump – it’s a no brainer" and "Vote Rump – it’s really rich and incredibly cheesy". You, which was also the agency behind the previous ads, said the controversial posters had garnered "worldwide publicity, all for a mere £100,000". The agency added that the Vote Rump campaign "promises to deliver a similar level of talk-ability". The "Vote Rump" ads will appear nationwide, with a particular focus on Transport for London poster sites, with one 48 sheet positioned at the exit of Westminster Station for the benefit of those working in and around Parliament. Erin Kennedy, marketing director at Gourmet Burger Kitchen, said: "Sometimes it’s the simplest ideas that are the most effective, and our new Vote Rump campaign is a prime example of that. "At GBK we never take ourselves too seriously so humour was always going to play a big role in this campaign – we hope people enjoy the ads, as much as the Rump Burger itself."